Golani is the oldest brigade in the Israel Defense Forces (IDF), started on February 28, 1948. It was a restructuring, in fact, of Hagana pre-state defense forces. With this early start, and its storied battle history, Golani has had no shortage of esprit de corps. Most indicative of the pride found among Golanchikim is the enormous collection of battle songs, company-based cheers, and most importantly, taunts against rival units. If you've read this blog, you'll know that our biggest rivals are the paratroopers. But what you haven't been privy to is our rivalry, or really just our jeering, with a different company in our same battalion. I'm sure it's like this in every battalion of Golani, but all I know is mine - and mine is vociferous! Company G, said rival, gets quite the ribbing from the Messayat, my company. Especially when we beat them in all kinds of tests, like a recent day where we scored higher in shooting drills and had a faster time in a full-gear and stretchers run. It took a few days for them to live that one down. turn, and we clap for them. Sad, sad Company B. Before I get taken away with this, I should back up quite a bit. This post isn't about the rivalry between the Messayat and Company G. Rather, I just want to talk about the songs and cheers that have become such an integral part of my life since joining this company and arriving in the battalion as a full soldier. In armies across the world there are songs, such as the famous "I don't know but I've been told..." Even better are U.S. Marine's cheers, especially songs like Blood and Guts. As you can tell, militaries will be militaries. The first Shabbat that I got to the Messayat I experienced one of the strangest nights of my life. After coming back from services, I found the group slowly forming a circle. Here was a company consisting of veterans and near-veterans, and there was my platoon, fresh from the training base. Young. Green. Everyone else had been in Gaza for Operation Cast Lead. We were two months into basic training. They were knocking down doors; we were stuck perpetually in pushup position. But nonetheless, we were members of this company now, and we found ourselves in a large circle on an equal footing. And then the songs started. Some of my guys knew a couple here and there, but most of us just clapped along, smiling awkwardly. And when the time would come, as it does for a few songs, we would run into the middle - jumping, cheering, punching and pushing. With the veterans. Guys that served in every major operating zone in the country. If anyone ever created one of those songs, many of which I'm sure have been passed down for generation upon generation, in an attempt to integrate the greenhorns, they can sleep happily knowing they accomplished the goal. I swear to you, however, that that first night with these strange songs and their respective physical interpretations (a certain dance, kneeling, jumping, etc), I thought that I had landed on another planet. What in the world was going on? The night was dark and the sky was orange from the sodium lights. A strong Golan Heights mist was swirling the crisp summer air, creating the effect that we were stuck inside a cloud. And here in the midst of bizarre weather were these battled 20-year-olds singing what can only be described as alien chants. Most of the language was well beyond my comprehension of Hebrew. Only now do I know what half of it means. The singing went on for an hour. A full hour of this massive circle, pulsating with pride and, admittedly, a desire to confront the enemy. Let's not forget this is Israel's most deadly infantry brigade. The energy level was enough to bring even me in, and I am not a singing or dancing type. I can't tell you how impotent I feel at the moment. I simply cannot describe the strangeness, oddity, mood, setting, and atmosphere of that first night. The unmatched out-of-placeness I felt, but all that without the typical accompanying self-consciousness. I thought I was in a movie about an army unit, rather than actually being deep within one. Maybe I can't describe it because it all seems so normal to me now, maybe because that was over three months ago, or most likely because I'm a hack writer. So hopefully a video or two of some of these songs, albeit not in the mentioned circle (which we do all the time, by the way), will show you just how intense the experience is. I could say a million things about a million songs, even some in Amharic Ethiopian, but let's just leave you in the same state I was in that first night: confused and unsure what it all meant. Note the girl halfway through. Terrible! The greatest threat to me in the recent past wasn't Hamas or Hizbullah, kidnappings or rocket launches, bombs or any other terrorist attack. Rather, it seems to be scorpion season around here. We've been finding them left and right, and they usually scare the hell out of us because they seem to be just where we had our hand or were sitting. That scorpion was in between the strap and back portion of a backpack that was moved and about to be picked up. Interestingly enough, however, turns out even crazed 18-year-old Golanichikim have compunction about killing even dangerous creatures. It took them about 10 minutes to figure out whether or not to kill it, with half the camp yelling for it, and the other half proposing to move it into the desert. Needless to say, our army boots are pretty good at crushing things. I haven't broached this topic for the entire length of writing this blog, mainly because I didn't know where to start. 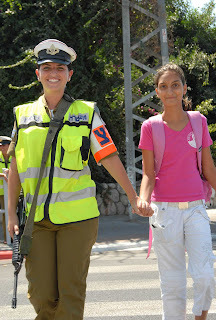 In a sentence, there is no more hated group of soldiers in the IDF than the military police - namely, the branch that stands around checking to see if the soldiers are wearing their uniforms correctly, are shaven, have all their papers, and so on. Combat soldiers especially feel a venomous animosity for these jobnikim that go home every week, do no 10k runs, do no hikes with half their body weight packed on them, and yet have the chutzpah - the chutzpah! - to give us a violation. What penalty does a violation incur? The worst penalty of all: confinement on base for anywhere from 21 to 28 days, and it can be much longer depending on your unit's schedule. When all your friends are going home, you know that you're staying on base not because you volunteered in order for others to have fun, but rather because some jerk in a white hat didn't see your dog tags around your neck. And if that confinement wasn't enough, enjoy your hearing with the battalion commander. Yeah, you read that. Even a little violation necessitates a mini-trial before a lieutenant freaking colonel. So how do these guys strike... There are certain days, hours, and places where soldiers pass through in high numbers in order to return to or go home from their bases. In an effort to not give Hizbullah any extra info on when kids are in high volume in certain places at certain times, suffice it to say that there are favored times of the MP to fill their quotas. So, on these particular days you get off a bus or a train, and standing right near the terminals or the entrance are the MP. Just waiting for you. Propaganda. Look at him smiling. White hat, white and red brassard (armlet), white belt, and a bloody nametag. A nametag. "Damnit," you think to yourself. Quickly, you better check to make sure everything is clear. Boots polished with no dirt showing from the week of crawling in the mud? Are your pant legs tucked into your socks so they are rolled up properly? Is your shirt tucked in neatly to your pants? Are all the buttons buttoned? Did you put your dog tag on, or did you forget that in your pocket because you only slept two hours the night before? Is your hair cut and not a little past the proper length? Not that you just spent 21 days on base or anything and there wasn't a haircutter. Is your beret in your epaulette neatly? And most importantly, if you have a beard do you have the permission form, and if you don't, are you 100% clean shaven? All of this is a split second check that is performed exactly one minute after waking up from a deep sleep on a two hour bus ride and exiting on to the sidewalk in a half-woken daze. While a Golani soldier is about to go into the West Bank and guard against terrorism, the MP are comfortably stationed in Tel Aviv near the beach, slapping around the defenders of the nation. Seriously, listen to this: Once during training one of our guys started telling a story about his brother and the Second Lebanon War. We all had heard stories about this guy, how he was a crazy veteran in his day. For example, he stood up in a battalion-wide meeting with the Chief of the General Staff (head of the entire army) and yelled "UNTIL WHEN? !," a popular veteran-only expression. That's craziness to do that. Anyway, this slightly deranged brother of our slightly deranged friend was a staff sergeant sniper. After spending twenty some days on base, the Lebanon War started back in 2006. That war lasted for 34 days. So, this guy wasn't home for fifty some days, minimum, and spent the entirety of it in combat. Scary, bloody, heart wrenching combat. He was a sniper, so you can imagine how personal the war was for him. As it was described to us, the war ended and they were given about 15 minutes to pack up once back at base and catch the last buses home. It was a scramble, but they made it just in time. These guys hadn't been in civilization for a long time, had probably seen their best friends either shot or hit with shrapnel or even worse. They hadn't spoken to their families for well over a month. Parents had no idea if their sons were alive, where they were, or what their conditions were like. Soldiers just wanted to get home. After all that, and having about 15 minutes to catch the last bus, the last thing on their minds was the mud on their boots or the hair on their chins. And yet, my buddy's brother after 50 days in combat was stopped by a military police officer and given a violation for all of the above. Apparently it was a scene, replete with yelling involving the words "war, combat, and Lebanon" on one side, and "rules, protocol, and tourists" on the other. Judge the situation for yourself. Just venting a little bit of frustration here. A button of mine fell off and I had to resew it with the only string I had at the time - it is blue. I better get some uniform beige string pronto!